The Killer B Jpipe is designed to be a direct replacement for the OEM Jpipe. 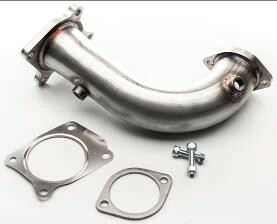 It is compatible with both the OEM Intermediate pipe as well as the Killer B Intermediate pipe. This product is designed to provide faster spool and be more responsive. · Designed with a free formed mandrel bend to provide maximum flow. · Removes factory catalytic converter and resonator. · 1/2” thick CNC laser cut flanges. · 3D CAD designed and tested. · Made with 304 Stainless Steel.